General Dynamics Ordnance and Tactical Systems–Canada offers five different types of 25 x 137mm rounds: – The Target Practice, Tracer (TP-T) – The Armour Piercing, Fin-Stabilized, Discarding Sabot, Tracer (APFSDS-T) – The Frangible, Fin-Stabilized, Discarding Sabot, Tracer (FAPDS-T) – The Target Practice, Discarding Sabot, Tracer (TPDS-T) – The High Explosive, Incendiary, Tracer (HEI-T). 25 X 137mm ammunition provides the firepower necessary to meet a variety of applications for the Bradley Fighting Vehicle, the LAV, other infantry fighting vehicles, and air defense platforms. The 25 x 137 mm Target Practice, Tracer (TP-T) cartridge is designed for use in the M242 Bushmaster I chain gun and Oerlikon-Contraves KBA machinegun. It matches ballistically the HEI-T C142 cartridge. Using components supplied by a US partner, the TP-T cartridge is assembled under licence by GD-OTS Canada in accordance with Canadian requirements. Its inert projectile is made of a hollow steel shell with alloy nose cap and tracer composition. Maximum Effective Range: 2,000 m.
Trace Visibility: Out to 2,000 m.
The 25 x 137 mm Armour Piercing, Fin-Stabilized, Discarding Sabot, Tracer (APFSDS-T) C137 cartridge is designed for use in the M242 Bushmaster I chain gun and Oerlikon-Contraves KBA machinegun. Using components supplied by Rheinemetall (formally: Oerlikon-Contraves Pyrotec AG), the C137 cartridge is assembled under licence by GD-OTS Canada in accordance with Canadian requirements. The projectile includes a tungsten-alloy long-rod penetrator which is carried in a plastic sabot. It is stabilized with aluminum fins and the rear of the fin unit contains a tracer unit. Penetration: 31 mm of armour plate at 60° obliquity at 2,000 m.
The 25 x 137 mm Frangible, Fin-Stabilized, Discarding Sabot, Tracer (FAPDS-T) C138 cartridge is designed for use in the M242 Bushmaster I chain gun and Oerlikon-Contraves KBA machinegun. Using components supplied by Rheinemetall (formally: Oerlikon-Contraves Pyrotec AG), the C138 cartridge is assembled under licence by GD-OTS Canada in accordance with Canadian requirements. The projectile is made up of a penetrator of frangible metal carried in a plastic sabot. After penetrating the target, the projectile disintegrates into a cloud of fragments to cause widespread damage. The 25 x 137 mm Target Practice, Discarding Sabot, Tracer (TPDS-T) cartridge is designed for use in the M242 Bushmaster I chain gun and Oerlikon-Contraves KBA machinegun. Using components supplied by a US partner, the TPDS-T cartridge is assembled under licence by GD-OTS Canada in accordance with Canadian requirements. Its projectile comprises an inert sub-projectile with a tracer in an alloy/plastic discarding sabot. 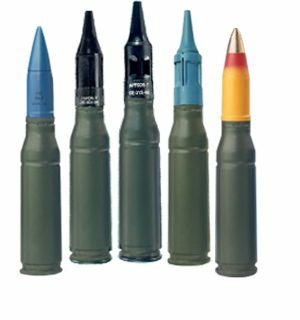 The 25 mm x 137 mm High Explosive, Incendiary, Tracer (HEI-T) C142 cartridge is designed for use in the M242 Bushmaster I chain gun and Oerlikon-Contraves KBA machinegun. Using components supplied by a US partner, the C142 cartridge is assembled under licence by GD-OTS Canada in accordance with Canadian requirements. Its steel thin-walled projectile is loaded with 30 g of HE and incendiary composition with red tracer composition at the rear. The C142 cartridge has a PDM 758 fuze with a self-destruct mechanism that activates between 6 and 19 s after firing should there be no target impact. Left: Target Practice, Tracer (TP-T) C152. Right: The Light Armoured Vehicle (LAV) III with M242 25-mm Bushmaster Cannon.